In any winning team there are always those that play a supporting role while others are destined to take all the glory. Onion, carrot and celery are often very much found in the former category, whether as a basis for a tomato sauce or providing the foundations for a sturdy braise. This is not to say that any of them should be treated with disrespect or their preparation regarded as of little importance. Italians pay particular attention to this structured approach to cooking, working on the basis that there is little chance of a recipe falling down provided each step is followed to the letter. Therefore, every dish begins with the battuto, or literally beaten, stage that refers to the downward action of the knife through the vegetables and onto the chopping board. This is followed by the soffritto which involves the sautéing of the vegetables in a skillet or casserole pan. It is very important that all the pieces colour and cook at the same rate so care should be taken during the battuto to chop evenly in order to achieve this, otherwise, for example, one piece of carrot is going to cook at a different rate to another, compromising the taste and texture of the finished dish. 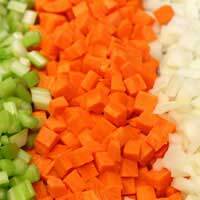 When sautéing, add the carrot and the celery first, followed by the onions. While the onion will soften and become translucent relatively quickly, the other two will take longer to break down and the desired result is that all three are at the same stage when the next series of ingredients are added. Be careful with the heat under the pan when sautéing, too. The word translates as jumping around, but light skips in the fat rather than high jumps and sizzling are the order of the day, otherwise the vegetables will burn, leaving a nasty taste that will permeate through the finished dish. While the sweetness of the carrot and subtle aniseed of the celery are best used as a base to build flavours, onions can take centre stage on a more regular basis. For example, a simple red onion salad can work very well with a number of grilled fish dishes. Rather than cutting the onion into fine dice as would be appropriate when preparing a soffritto, it should be reduced to very thin rings by approaching it side on and cutting across the equator. The layers should be built up on a large serving dish, and then finished off with some extra virgin olive and balsamic vinegar in a ration of 3:1 immediately prior to laying on the table. Onions also work well stuffed or ripieno in Italian. Using a sweeter white onion cut across the equator and nip off the end of the root so that the onion halves sit steadily in an over-proof dish. Then bake for around half and hour, remove and scoop out the now soft centre. Mix with any combination you like, for example some browned meat, or perhaps some cheese and chopped flat-leaf parsley. Fill the onion hollows with the mix, sprinkle on some breadcrumbs and then bake for a further 15 minutes.